News & Advanced Search Feedback? Abstract: The CML151XW is a 15" TFT display with the distinction of having one of the highest contrast ratios of any 15" flat screen we've looked at so far. The CML151XW is a 15" TFT display with the distinction of having one of the highest contrast ratios of any 15" flat screen we've looked at so far. With its 350:1 contrast ratio the Hitachi display offers some positively bright whites and dark blacks. It also offers a removable display panel for wall-mounting, and a swivel base - a somewhat rare commodity in flat panel displays. With its' two tone gray exterior the CML151XW is quite stylish and sports the typical dot pitch of 0.297mm. 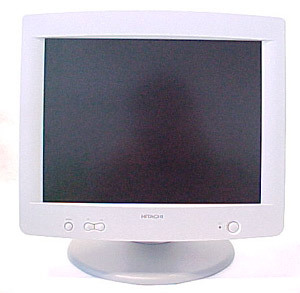 As with most 15" LCD displays the max resolution of this display is 1024x768 pixels. The analog connection on the back side of the panel display means this unit can be hooked up to an existing video card without having to go through the hassle of buying a new adapter card. The display does not however support any digital display connection. The front bezel is one of the most understated we've seen for some time, with only three control buttons, and one power button. Thankfully, the bezel still has a good "post-it" frame around the TFT panel. It's a minor point, but some of us live by those little yellow post-it notes. We always suggest you test any flat panel display you are considering in the store before you pay for it . LCD panels are very complex components to construct and most manufactures only guarantee their display's to be 99.9% free from defect. That means there can be up to 3 or 5 broken pixels before the display is considered "broken." Broken pixels are individual pixels in the display panel which are stuck on a certain colour, are constantly dim, or are always off. Depending on the location and intensity of a broken pixel they can be next to invisible, or glaringly obvious. The Hitachi CML151XW we tested had a flawless panel, but we have in the past encountered broken pixels with other manufacturers displays. Bottom line, it pays to check the display first, regardless of who makes it. Use the power of Google to search all of PCSTATS and the PCSTATS Forums. Tell us what you think of this new feature - FEEDBACK?